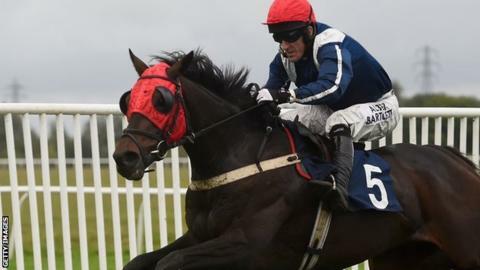 Champion jump jockey AP McCoy will miss Cheltenham's weekend meeting after giving up mounts at Wetherby on Wednesday - including three winners. McCoy, 40, was feeling the effects of a heavy fall last week and was stood down by the course doctor. A 150th success of the season earlier on Wednesday marked the halfway point in his bid for an unprecedented 300 winners in one campaign. But he has decided to miss the Showcase meeting at Cheltenham. The Northern Irishman was wincing with shoulder pain after partnering Goodwood Mirage to victory at Wetherby and later missed a certain win on Presence Felt, who was left with a walkover after three non-runners. McCoy has told BBC Radio 5 live he is "dreading" retirement in the future. "I dread the day that comes," the 19-time title winner said. "First and foremost, I need to be successful. If I wasn't successful, I couldn't carry on. "If I'm suddenly not as good as I once was, then I would hate to carry on. The enjoyment is in winning - much as I enjoy my job." McCoy recorded the programme on Tuesday night after returning to action with a treble at Huntingdon following three days on the sidelines prompted by a fall at Worcester. Amateur Harry Bannister came in for the winning ride at Wetherby on Presence Felt, part of a four-timer for trainer Jonjo O'Neill. "AP says he's very sore. The fall last week would have kept normal jockeys off for a couple of weeks but he's not normal, is he?" said O'Neill. McCoy is on course for his 20th successive jockeys' championship in a record-breaking career. In November 2013, he passed the landmark of 4,000 wins despite a string of injuries.